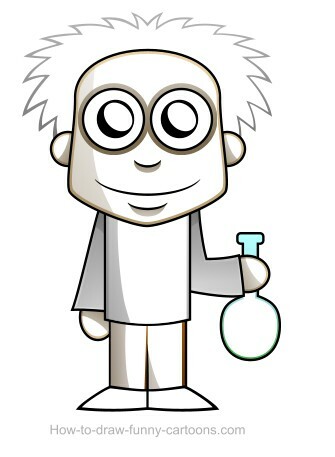 To duplicate this scientist drawing properly, you need a pencil, a piece of paper, a vector application and some free time! This tutorial is more suitable for advanced users, but you can still achieve a great results using only pencils. 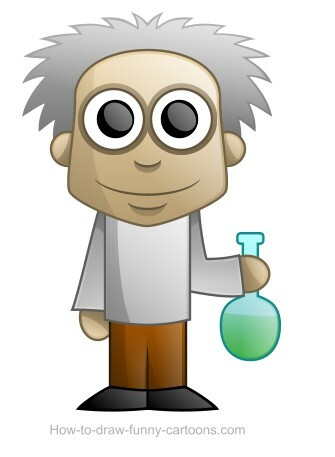 You will have the opportunity to draw a scientist made with simple effects to give more depth to the illustration. Are you ready to draw? Let's start with the first step! First, you need to draw the character using a few dark lines. Start with the head and don't hesitate to draw a large jaw and a cute chin. Then, you can use a rectangle to illustrate the body of the scientist. Use another rectangle to represent the legs. Finally, you can draw arms and add hands using circles. If you prefer to draw fingers, then feel free to do so. 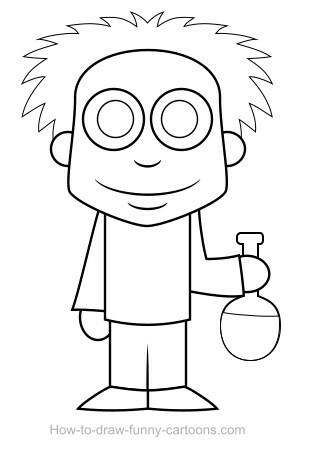 For the second step, simply draw more details inside the character like adding eyes and pupils using circular shapes. Then, draw a few lines on the face to represent the nose, the mouth and the chin. 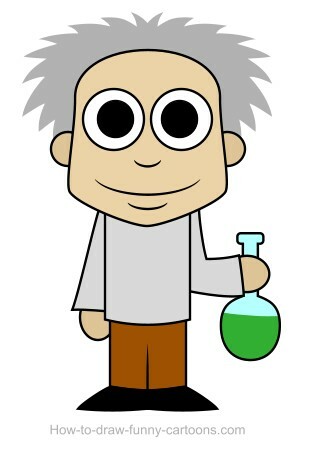 You can also draw the feet, the hair and the bottle in the right hand of the cartoon character. Great! The result is already fun to look at, but adding colors might be a good idea. 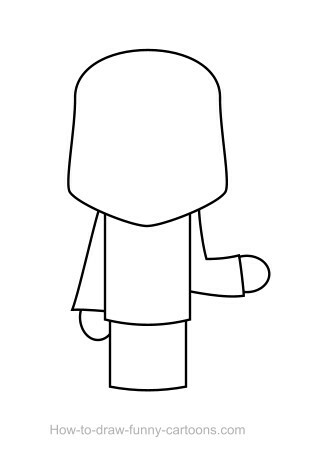 For now, you can use plain colors to fill in the various shapes used to illustrate the character. Hair can be grey, the pupils are black, the bottle is blue and green while the pants are brown. The feet can also be colored in black. It's now time to perform a few tricks to create more volume. The first thing we can do is use the gradient fill to add a second color on most shapes. For example, you can add a darker version of the grey color on the bottom of the shape used to illustrate the hair. Repeat the same technique on all shapes and always make sure that the darkest color is on the bottom. Great! Now we can also create additional shadows on the character to give more depth to the illustration. As you can see on the illustration on the left, darker shapes were drawn on the character (mostly on the left side of most shapes). These shapes will be used to enhance the effect and make the scientist drawing easier to read. Of course, in the previous step, the shapes were too dark to be effective. Your goal is now to play with the opacity of the darker shapes to create a subtle effect. These shadows must be soft and not too distracting. Good! We can perform one last effect to give life to our little cartoon friend! It's true that the drawing on your left might look weird. What I did was duplicate all shapes and change the color of the new shapes to white. Previously, we added a few dark areas to give more depth to the character. We are now performing the opposite operation by adding bright areas on the right side of the scientist drawing. Once again, you need to play with the opacity of the white shapes and make sure that they are subtle and soft. This time, each white shapes must be 100% visible on the right side, but 100% hidden on the left side. The goal is to make lighting interesting and relevant with the shape we are working with. One last thing we can do is modify the color of the outlines. We started this tutorial with black outlines. Black outlines are great, but using colored outlines is even better. The result is more pleasant and colorful. That's it for the creation of a scientist drawing. I hope you had fun and don't hesitate to try more tutorials!